Do I dare admit how long I’ve had these Thai chicken spring rolls in my drafts folder? I had originally planned to replace my Thai Chicken Lettuce Wraps with this updated version, but I thought it would be nice to give it its own post. And then I got distracted. Such is my life. 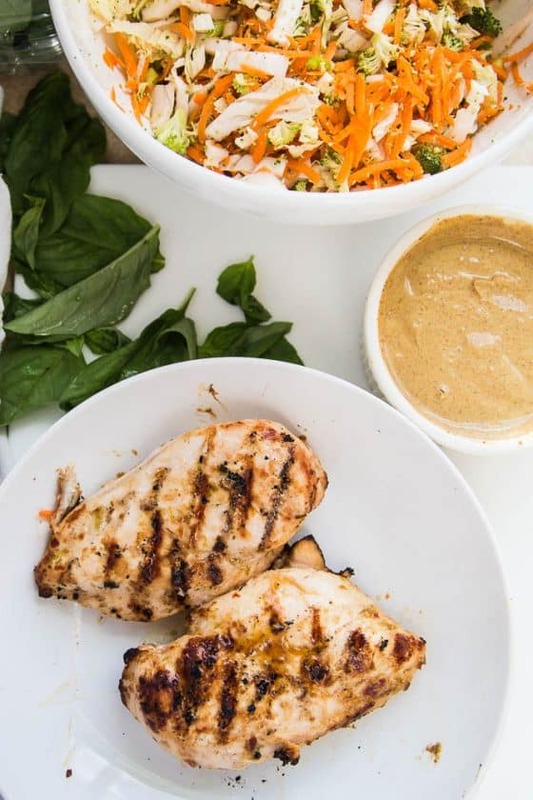 What we have here is the salad and sauce from the Thai Chicken Lettuce Wraps (one of my oldest and most beloved recipes) and the chicken from the Paleo Thai Grilled Chicken post. All wrapped up in a spring roll. With the best dipping sauce you’ll ever eat. It’s a match made in heaven, really. I like it when I can rearrange recipe components and make something completely new. 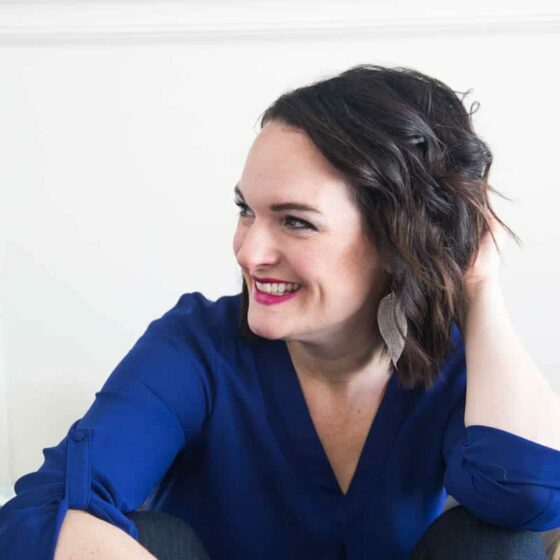 It’s like having a capsule wardrobe, but with your recipe stash. You might look at the recipe and your eyes may immediately glaze over. Yes, it’s a lot of ingredients between the chicken marinade, the sauce, and the salad filling, but a lot of those ingredients overlap. AND you can make ALL of it ahead of time and assemble the spring rolls when you want. BONUS: No oven or stove required! 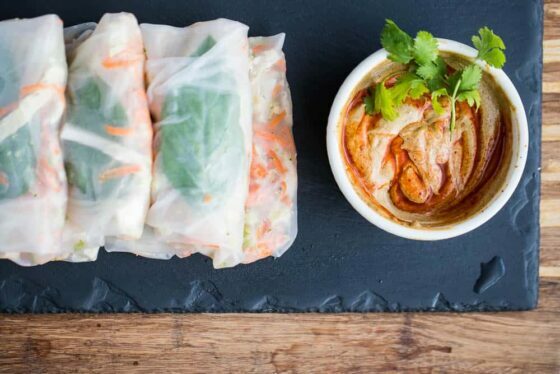 Assembling spring rolls is slightly tricky, but after a couple, you’ll be a pro. Just remember to make it as compact as you can and roll them tightly. And don’t stack soaked spring roll wrappers on top of each other or you may find yourself uttering some fun curse words. Once they’re finished you can stack the rolls, but only for a little while. If you’re making these a couple hours ahead, then lay them flat in one layer to store. Can we talk about this dipping sauce? It’s everything I want in a “peanut” type of sauce — it’s creamy, a little spicy, and you’ll find yourself putting obscene amounts on your spring rolls and licking it off your fingers. 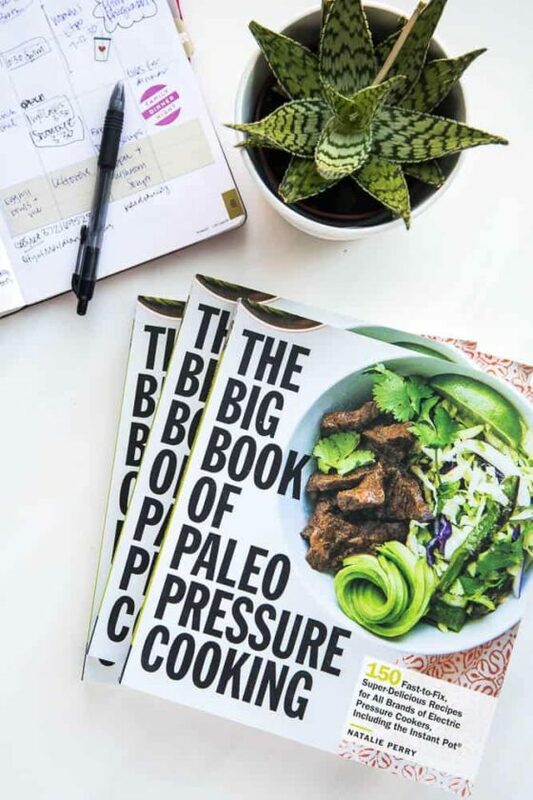 Maybe you ought to make a double batch? 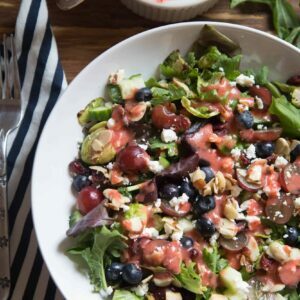 It’s FAAAAABULOUS as a salad dressing, too. 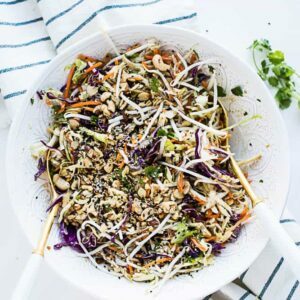 Speaking of salad, if you’re keto or watching your carbs, then ditch the spring roll wrappers. Just pile everything into a bowl and drizzle it with that dressing. You’ll love it. 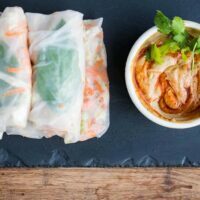 Thai Chicken Spring Rolls are a light and tasty dinner for a warm summer night, but the real star of this recipe is the "peanut" sauce. It's a Thai-inspired almond butter based sauce that mimics peanut sauce. You'll want to put it on all the things. Put the chicken in a large zip top bag or in a shallow container for marinating. Combine the rest of the ingredients in the first section in a small bowl, then pour it over the chicken. Massage the chicken a bit to coat it evenly in the marinade and chill for at least 4 hours, up to 24 hours. To make the sauce, put all of the sauce ingredients in a blender or food processor and blend until smooth. You can also put it in a large mason jar and whisk or shake it really well. Chill until ready to use. To make the salad filling, put the carrots, broccoli, green onions, and cabbage in a large bowl. Drizzle with lime juice and oil, and sprinkle a pinch of salt on top. Use your hands or salad tongs to mix well. Chill until ready to use. When it's time to make the spring rolls, preheat your grill to high heat. Remove the chicken from the bag and discard the marinade. Grill the chicken until dark grill marks form on both side and the chicken is cooked through, about 6-8 minutes per side, depending on how thick your chicken is. 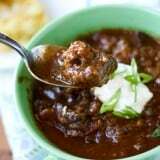 Remove from heat and let it rest while you assemble the other ingredients. Fill a large shallow bowl or dish with warm water and set a couple of paper towels on a flat surface you're going to use to roll the spring rolls. Slice the grilled chicken thinly. 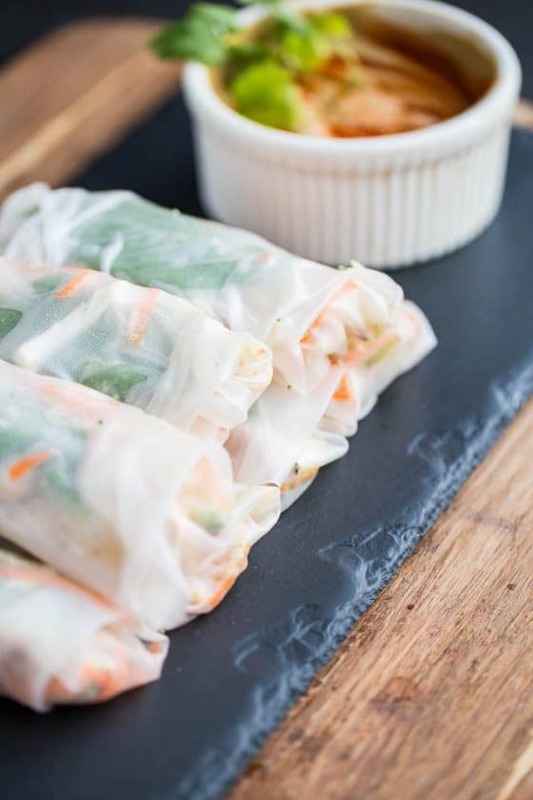 To assemble the spring rolls, soak each spring roll wrapper (individually) in the water for about 30 seconds or until it is very soft and pliable. Transfer it to the paper towel to soak up some of the excess water. 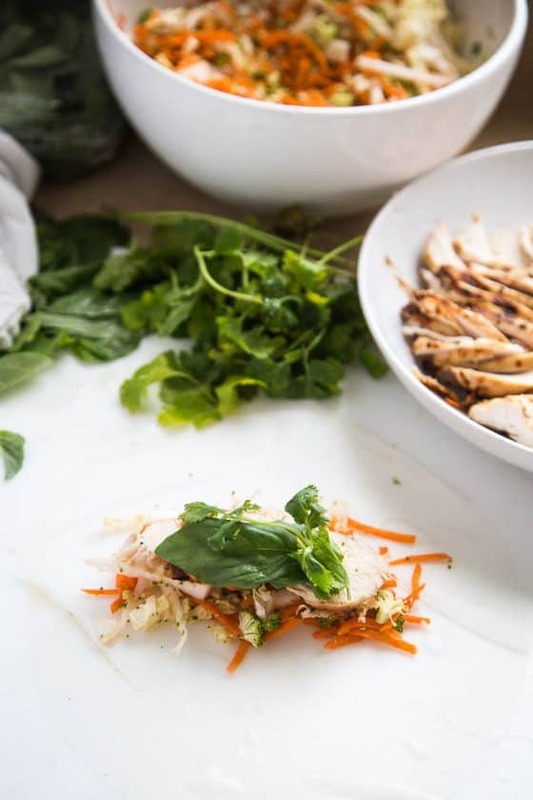 Put about 1/4 cup of the salad filling into the center of the wrapper and stack a few slices of grilled chicken and a couple leaves from each herb (basil, cilantro, mint). Bring the bottom of the wrapper up toward the middle and place it over the filling. Fold in the side edges, then roll the whole thing tightly away from you. 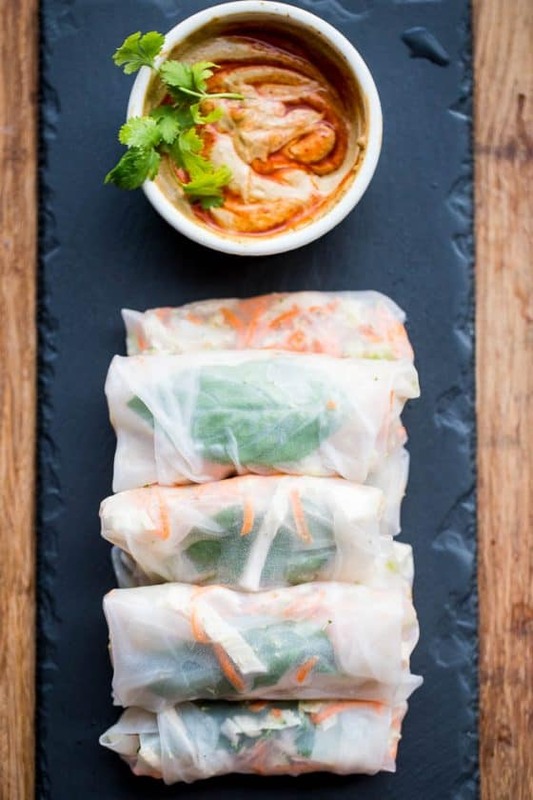 Repeat with the rest of the spring roll wrappers and filling ingredients. Swirl some Asian chili paste or sriracha into the peanut sauce and serve the spring rolls alongside. Are spring roll wrappers gluten free. Typically they are since they’re rice-based, but it’s always good to check ingredient labels just in case.